Well, it is almost summer so this may be a little late in the year. You might also be able to complain that it is a poem not prose. Okay, she was a poet and I find a lot of her stuff quite appealing (!) but she wrote a fair bit, as below, in a ‘prose-poem style’…… which I obviously like too. For me she tells a good story, highly descriptive but in short bursts of journalistic style. Good for the period she wrote in. Reminds me of Hemmingway, despite the theme! She did write a similar piece an the day after a Zeppelin bombing raid on London in early WW1, when she was here on a visit. She did visit London around the time but I dont know if she was in the actual vicinity……..I suspect not. The day is fresh-washed and fair, and there is a smell of tulips and narcissus in the air. The sunshine pours in at the bath-room window and bores through the water in the bath-tub in lathes and planes of greenish-white. It cleaves the water into flaws like a jewel, and cracks it to bright light. Little spots of sunshine lie on the surface of the water and dance, dance, and their reflections wobble deliciously over the ceiling; a stir of my finger sets them whirring, reeling. I move a foot, and the planes of light in the water jar. I lie back and laugh, and let the green-white water, the sun-flawed beryl water, flow over me. The day is almost too bright to bear, the green water covers me from the too bright day. I will lie here awhile and play with the water and the sun spots. The sky is blue and high. A crow flaps by the window, and there is a whiff of tulips and narcissus in the air. In the fresh-washed sunlight, the breakfast table is decked and white. It offers itself in flat surrender, tendering tastes, and smells, and colours, and metals, and grains, and the white cloth falls over its side, draped and wide. Wheels of white glitter in the silver coffee-pot, hot and spinning like catherine-wheels, they whirl, and twirl—and my eyes begin to smart, the little white, dazzling wheels prick them like darts. Placid and peaceful, the rolls of bread spread themselves in the sun to bask. A stack of butter-pats, pyramidal, shout orange through the white, scream, flutter, call: “Yellow! Yellow! Yellow!” Coffee steam rises in a stream, clouds the silver tea-service with mist, and twists up into the sunlight, revolved, involuted, suspiring higher and higher, fluting in a thin spiral up the high blue sky. A crow flies by and croaks at the coffee steam. The day is new and fair with good smells in the air. Over the street the white clouds meet, and sheer away without touching. On the sidewalks, boys are playing marbles. Glass marbles, with amber and blue hearts, roll together and part with a sweet clashing noise. The boys strike them with black and red striped agates. The glass marbles spit crimson when they are hit, and slip into the gutters under rushing brown water. I smell tulips and narcissus in the air, but there are no flowers anywhere, only white dust whipping up the street, and a girl with a gay Spring hat and blowing skirts. The dust and the wind flirt at her ankles and her neat, high-heeled patent leather shoes. Tap, tap, the little heels pat the pavement, and the wind rustles among the flowers on her hat. A water-cart crawls slowly on the other side of the way. It is green and gay with new paint, and rumbles contentedly, sprinkling clear water over the white dust. Clear zigzagging water, which smells of tulips and narcissus. The thickening branches make a pink grisaille against the blue sky. Whoop! The clouds go dashing at each other and sheer away just in time. Whoop! And a man’s hat careers down the street in front of the white dust, leaps into the branches of a tree, veers away and trundles ahead of the wind, jarring the sunlight into spokes of rose-colour and green. A motor-car cuts a swathe through the bright air, sharp-beaked, irresistible, shouting to the wind to make way. A glare of dust and sunshine tosses together behind it, and settles down. The sky is quiet and high, and the morning is fair with fresh-washed air. Swirl of crowded streets. Shock and recoil of traffic. The stock-still brick façade of an old church, against which the waves of people lurch and withdraw. Flare of sunshine down side-streets. Eddies of light in the windows of chemists’ shops, with their blue, gold, purple jars, darting colours far into the crowd. Loud bangs and tremors, murmurings out of high windows, whirring of machine belts, blurring of horses and motors. A quick spin and shudder of brakes on an electric car, and the jar of a church-bell knocking against the metal blue of the sky. I am a piece of the town, a bit of blown dust, thrust along with the crowd. Proud to feel the pavement under me, reeling with feet. Feet tripping, skipping, lagging, dragging, plodding doggedly, or springing up and advancing on firm elastic insteps. A boy is selling papers, I smell them clean and new from the press. They are fresh like the air, and pungent as tulips and narcissus. The blue sky pales to lemon, and great tongues of gold blind the shop-windows, putting out their contents in a flood of flame. The day takes her ease in slippered yellow. Electric signs gleam out along the shop fronts, following each other. They grow, and grow, and blow into patterns of fire-flowers as the sky fades. Trades scream in spots of light at the unruffled night. Twinkle, jab, snap, that means a new play; and over the way: plop, drop, quiver, is the sidelong sliver of a watchmaker’s sign with its length on another street. A gigantic mug of beer effervesces to the atmosphere over a tall building, but the sky is high and has her own stars, why should she heed ours? I leave the city with speed. Wheels whirl to take me back to my trees and my quietness. The breeze which blows with me is fresh-washed and clean, it has come but recently from the high sky. There are no flowers in bloom yet, but the earth of my garden smells of tulips and narcissus. My room is tranquil and friendly. Out of the window I can see the distant city, a band of twinkling gems, little flower-heads with no stems. I cannot see the beer-glass, nor the letters of the restaurants and shops I passed, now the signs blur and all together make the city, glowing on a night of fine weather, like a garden stirring and blowing for the Spring. The night is fresh-washed and fair and there is a whiff of flowers in the air. Wrap me close, sheets of lavender. Pour your blue and purple dreams into my ears. The breeze whispers at the shutters and mutters queer tales of old days, and cobbled streets, and youths leaping their horses down marble stairways. Pale blue lavender, you are the colour of the sky when it is fresh-washed and fair . . . I smell the stars . . . they are like tulips and narcissus . . . I smell them in the air. Some people will be pleased to know I have just re-started my next book. I have been labouring under a cloud of lethargy but at long last I have a bit between my teeth and am chewing over the smaller details. For once I have drafted out cues for each section (a process I have NEVER done before)……sorry for shouting!……. and intend to vaguely follow them to the end. However I do have to admit that the actual journey to hit my cue-marks may be affected by some daunting (ie can I really be bothered!……..look, no shouting…..) research. Some characters follow on from ‘Certain Trace’, the book (novella) I finished yonks ago. Maybe this one will be as short so I can nail them together as the opposite of a spin-off character-led series. 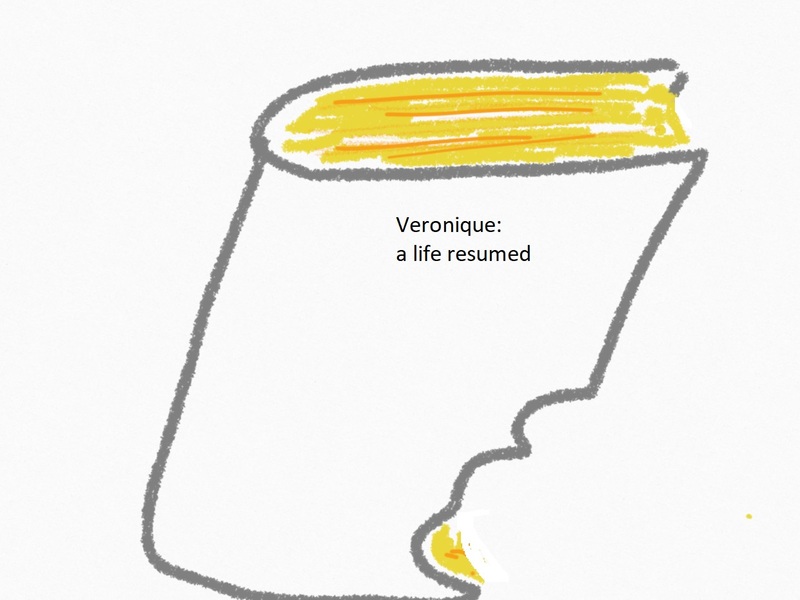 In theory it covers in more detail some of the events of Veronique, Charlie and one or two others that you will not know unless you read ‘A Certain Trace’. Unlikely as it has not yet been published. I did put out a little sneaker section called ‘Extraction’ in ‘wordparc’ some time ago. I feel sure this character (Michael Wise, Captain…….or Major, as he became during World War 1 at Cambrai) will also appear as I got quite fond of him. 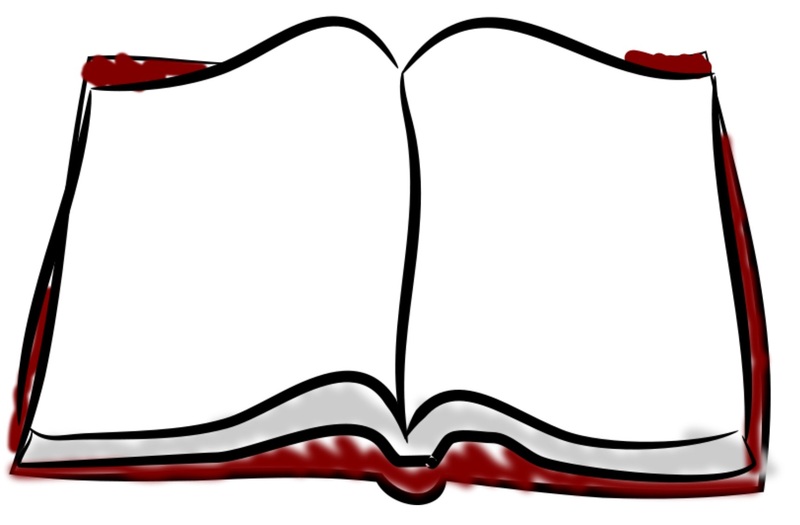 Word to the wise, or unwise!…… DO NOT GET TOO FOND OF YOUR CHARACTERS…… when you kill them off, it hurts! Okay, no more shouting. Who knows where the best laid plan may actually lead you, the writer. That is part of the glory of being a writer, for me, that is: not quite in control. I know where I want to go but the journey can be meandering. Fascinating. And I will have to stick some fingers into the lives of the Burnthorpe townies and assorted others in between, so words may not always add up! Now, where’s that dictionary; and my glasses! Better make a cup of coffee first. And find a couple of biscuits……..
John Clare, notes for wildlife talk. There is much to be said about John Clare as a poet but he is probably best known as a highly observational poet and writer of Nature from his world of part-fenland, moorland, wood and even recently enclosed farm-lands surrounding his home village of Helpston a few miles north-ish of Peterborough. Even today ornithologists recommend new enthusiasts to read his writings for accurate descriptions of birds and their activities. And then he flew away ere his feathers they were dry. And left his little footmarks, trample where he would. And chirrupt up his wings to dry upon the garden rail. So, little Master Wagtail, I’ll bid you a good-bye. I should say here that Clare was not enthusiastic about punctuation and his spelling was variable plus his use of Northamptonshire dialect words to add to the mix. So that’s my excuse! I just read the best I can! And glad the cotters’ quiet toils again. And with their legs stroke slumber from their eyes. By giving for her honey melody. Sturts quick as fear – and seeks its heavy lair. He found a weary fox and beat him out. But the old shepherd took him for the skin. He up and snapt and bolted through the hedge. The ploughman wished he had a gun to shoot. The old dog barked and followed the pursuit. And ceased to chop and wondered at the fray. He threw his hatchet–but the fox was bye. He found a badger hole and bolted in. He lived to chase the hounds another day. (Punctuation and spelling as from JC mss, text from ‘Clare, NOES’, published Oxford. Ed’s: Robinson & Summerfield ) If available still, a good collection to have. It does look like wildlife was considered entertainment or a threat in Clare’s day too. I reckon the owl mentioned is the one known as Eurasian eagle owl from Clare’s note of colour and nesting. Not the white, Arctic Owl. Pine-Martins are extremely secretive animals and very scarce in most of England. From this poem we again see Clare’s quality of observation including boys and hunters’ proclivities of the day. Clare was not averse to egg-collecting in his youth, I doubt he was actively a poacher or into badger hunting and the like but was an observer of detail around him, including the activities of people. His poem of a ‘Badger’ being cornered by dogs and men can be read as straightforward, vivid, descriptive fact but also as anti-hunting. Though he may not have been able to declare it openly. The poems of Fox and the Vixen have similar sympathies with the animals. In Clare’s poem the pine marten the owl is realistically described. I looked for poems that described the owl rather than just promoting it as a mystical, magical or wise old bird. Apparently, it is none of those things….. There are very few that limit themselves to description only, maybe because they are nocturnal. Or I haven’t looked hard enough. The dark owls sit in solemn state, Like stranger gods; by twos and twos Their red eyes gleam. Motionless thus they sit and dream Until that melancholy hour When, with the sun’s last fading gleam, The nightly shades assume their power. For he who follows every shade, Carries the memory in his breast, Of each unhappy journey made. Ted Hughes’ writes The Owl: . A short poem with the briefest of image, much like sightings can be. Ask a local and they will say it is always there in the periphery, on the edge of vision. Driving fast, you might spot it, silhouetted as black as the night it should be hiding in. Swinging heavily to my movements as I walk. Like a burden she hangs on me. Are a heaviness, and a weariness. Swallows with spools of dark thread sewing the shadows together. A sudden turning upon itself of a thing in the air. A dip to the water. As the bats swoop overhead! Black piper on an infinitesimal pipe. Wings like bits of umbrella. And grinning in their sleep. Now there’s a man who has been tested but is still able to find his sense of humour. Forty Years Old, a celebration! 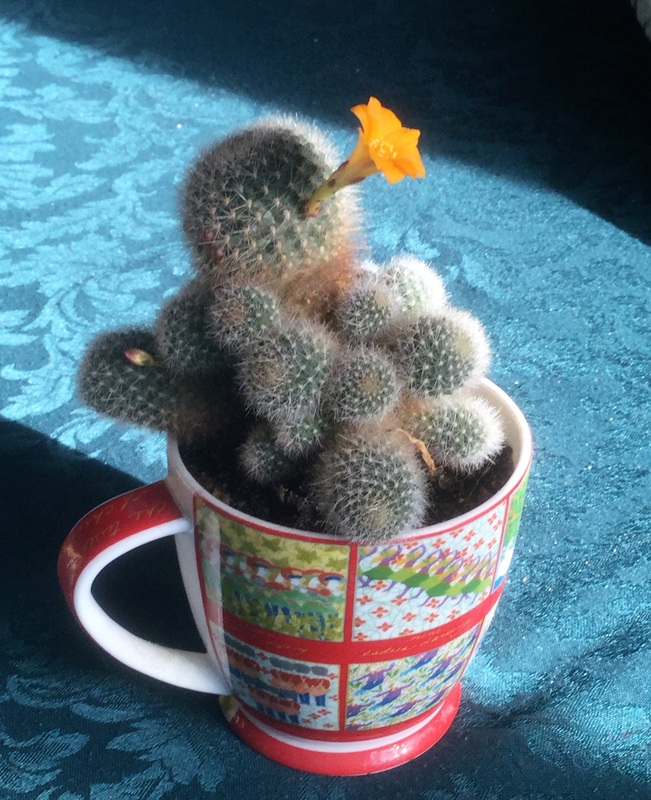 Maybe not the biggest cactus in the world but grown from seed, surviving heat, cold, lack of water (sometimes too much) and finally placed in a nice Christmas mug and by a sunny windowsill with a view, is something to trumpet about. A fortieth year worth remembering. 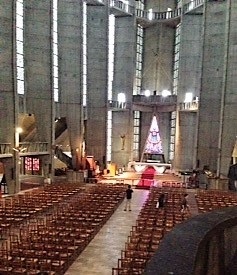 A brief holiday was highlighted by a visit to this church, rebuilt from 1950-53 on the site of a neo-Gothic church that was destroyed towards the end of WW2 as was all its surrounding town. Flattened by two bombing raids as a strategic site of a last stronghold, this old town on the banks of the Gironde was rebuilt after the war and retains a distinctly well designed appeal from its promenading marina and beach area with its open space for a temporary arena for musical or other entertainments. Its restaurants and hotels along the front, short cut-throughs to assorted shopping streets and an easy stroll to its highest point where we have the ‘new’ church, built almost sixty eight years ago. From across the wide river-mouth you can see what appears to be, a large, dark church with a spire sitting high on a hill and the town buildings settled all around. Once in the town you can spy its tower from many points in gaps between buildings. When you glimpse it, as a visitor, it’s appearance might cause some curiosity. The town small is enough for the tower to guide you to the open paved space around the church. Larger than you might expect. Describing it is not easy. Simply: It’s concrete. Slabs of raw concrete, striated with sides heaving upwards. Elements of curved corners but outweighed by a tower that looks too solid to grow that tall. A couple of small elemental, external balconies higher and higher that could be niches in a cliff-face. A building that is instantly iconic. A dark slab of a silo. 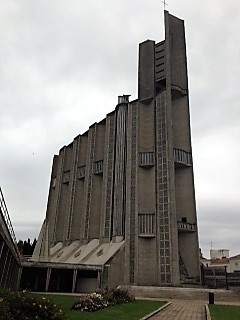 A construction that fits into the brutalist style. It certainly responds defiantly to the destruction of the church and town. It shouts out that buildings and communities can be rebuilt in strength. Time may forge differing opinions but this church now also stands as a significant challenge to time. 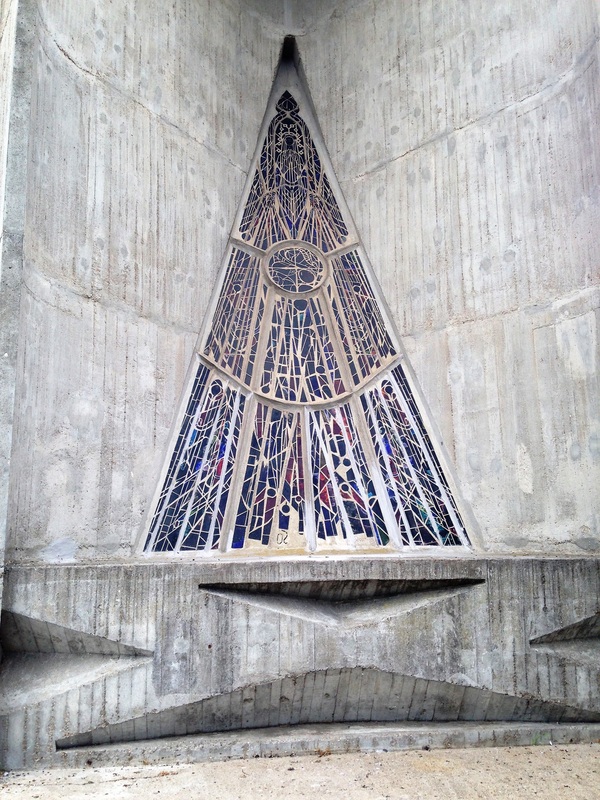 At the base of the tower, from a distance, there seems to be a door. Arrow shaped and guartered with iron but as you approach you realise it is the glitter of lead around stained glass, almost as grey as the concrete walls. Slightly to the side of this main building is attached a low heavy lintel-like roof extending out and joining to a short walkway. At the connection of this lowering roof, almost like an entrance to a cave, the opening beckons you into the darkness like no other church has. Unfortunately these photographs have decreased the contrast of the darkess within the space of this huge building and the light sparkling through the stain-glass. It is a truly dramatic, emotive, effect to stand within and feel this vast and magnificent construction. Once inside, the dimly lit church retains its heavy power as you walk under more low (relatively) ceiling , before you are realise you stand in a vast space of a church. The low ceiling is in fact a balcony walkway around one side of the building, a similar on the other side. And ones above matching those outside. Light reflecting through angled stained-glass windows along the wall are all in limited colours and simple design; fascinating in themselves as some of the glass has been angled and protrudes like modern art work. As they are. You can follow the balcony right towards the altar but I sugge st you move towards the far door which in this case was open. ( the main entrance) From here you can look back into the church and the beauty of the distant window behind the altar glowing in its limited palette. And feel the still darkness of the huge, no, awesome, wide and high building. No longer oppressive. Then walk forward down the aisle, or round the sides and stand before the altar. 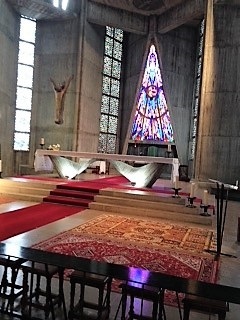 The altar, a plain slab placed on a simple double-curved plinth. Effectively, theatrically spotlit on the curves, enough to highlight them and lead your eyes upwards and behind to that arrow shaped design you first saw from the outside. A graduating, rising, spark of colours that burst triumphantly skywards as dramatic counterbalance to the cavernous space and darkness. My words really don’t do justice to this building. 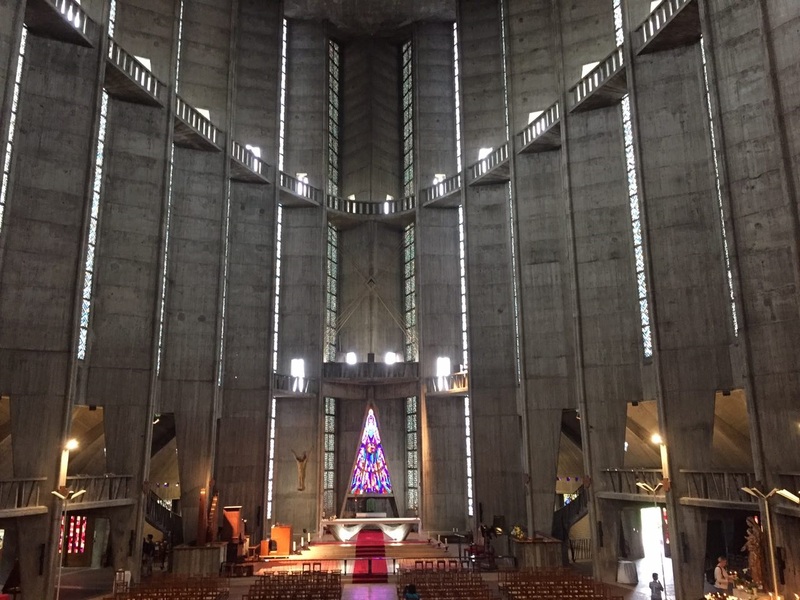 I doubt it can compare to the huge design and minutiae of the Gaudi Cathedral in Barcelona but… you knew there was a but: for me it just might compare in grandeur for its sheer simplicity. This is a building that defies catastrophe, lives as an iconic design and inside offers a world of stark, aesthetic solace and peace. 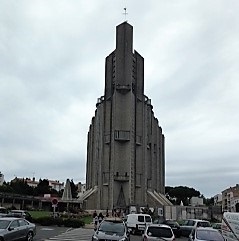 When in the Bordeaux region, visit this church in Royan.